Escape to an oceanfront luxury hotel designed for worry-free vacations, with the vibrant attractions, shopping and nightlife of Isla Mujeres, Mexico just moments away. Izla Hotel welcomes you to enjoy five-star service and amenities just steps from a beautiful white sand beach and the warm Caribbean Sea. Boasting 123 beautifully designed guest rooms overlooking two pools and the ocean, the hotel features a modern Mexican décor and the full range of resort-style amenities. Relax on the beach, splash with the kids in the pool, or enjoy your favorite ice-cold cocktail while lounging by the adults only pool. Begin your day with our complimentary breakfast and bring it to a tantalizing close with creative cuisine at our onsite restaurant. Come experience a fresh and exhilarating approach to Isla Mujeres luxury at a one-of-a-kind beachfront retreat that feels worlds apart from civilization yet right in the heart of it all. 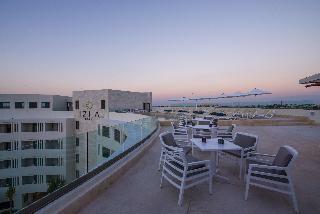 Izla Hotel is exactly the Mexico you've come to discover.